We welcome your ideas too. Do you have any tips you can share with all us of to help save money at the movies? Do you have a favorite local theater that offers movie discounts nearby? This post may contain affiliate links which means we may get a small referral commission at no additional cost to you if you use our links. We’re thrilled to announce that Carmike Cinemas (which includes Wynnsong, Muvico, Ovation, and Sundance Cinemas) is now part of the AMC Theatres family, and we’re so excited to start this new chapter together. Gofobo.com: Enter your zip code and select a movie to see if there are free movie tickets available near you. Be sure to register so they can contact you if a new screening becomes available in your area. advancescreenings.com : Select a movie and see if any free movie tickets are available for the screening in your area. GetScreening.com – They are updating their website at the time of this posting. Lionsgate – Enter your zip code to see if there are any free movie screenings of Lionsgate films in your area. SeeItFirst – This is where you can find free movie tickets for Disney movie screenings. Cinemark Early Bird – discounts for the first matinee show of the day, every movie, every day. See their list of early bird discounts near you from participating movie theaters. At Fandango, you buy your tickets ahead of time online, read movie reviews, and can get discounts. There is a convenience fee. Follow your favorite movie theaters on Twitter, Instagram, and Facebook. They often have special promotions just for fans. Subscribe to the Cinemark email for concession stand discounts and special offers. AMC Group Sales – get details about purchasing movie tickets in bulk. Cinemark Reel Family Time – discounts for large parties or large families. Program valid only at participating Cinemark Theatres. You can often watch two new-release movies at a drive-in for less than the cost of one ticket at a traditional theater. AAA offers discount movie tickets to members for AMC, Century, CinéArts, Rave, Tinseltown, Regal Cinemas, Edwards, and United Artists theaters. Also, if you are a member of a union or trade organization, check your benefits for access to discounts on movie tickets and more! AMC Theatres – Make Thursday your movie night at an AMC Theatres location. It’s the only day you can get discounted tickets with a student ID. See up to 3 movies every week in IMAX®, Dolby Cinema, RealD® 3D, digital and more for just $19.95/month + tax. No blackout dates. Cinemark Connections – join for free and redeem your points for awesome rewards like digital downloads, savings on concessions, trips/contests, premieres and more. Order an Entertainment Book for your city. Then, use it to get movie tickets for as little as $6 each. Eligible theaters include Regal, United Artists, Edwards, Showcase, Multiplex, Cinema Delux and AMC. The movie ticket discounts alone will cover the cost of the books. There are tons of restaurant and fast food deals too. Before your purchase, preview the book by typing in your zip code. Several readers are enjoying a monthly membership with MoviePass? Have you tried it? Are you going to stick with them since they changed up the rules? 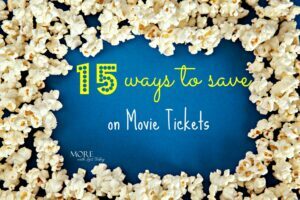 Do you know other ways to get discounts on movie tickets? Share in the comments so everyone can benefit! Great tips! I’m pinning this for future reference.